There is no greater aperitif than a long walk. Strolling at an easy pace, admiring buildings and people along the way, works up an appetite like sitting in traffic never can. While the number of restaurants within walking distance (and worth eating at) isn’t tremendous in our Pasadena neighborhood, The Astronomer and I have a solid list of go-to places including Pie ‘n Burger, Old Sasoon Bakery, and Cham Korean Bistro. 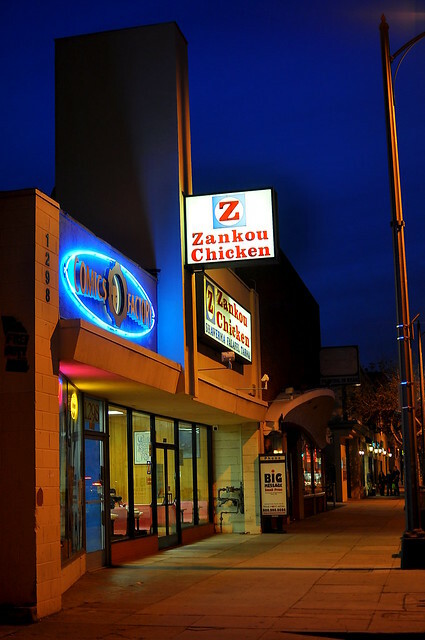 Our most recent addition to the walkable and craveable list is Zankou Chicken, an L.A. institution located about a mile from home. This much-loved rotisserie chicken shack was founded in Beirut in 1962 by Vartkes and Markrid Iskenderian. 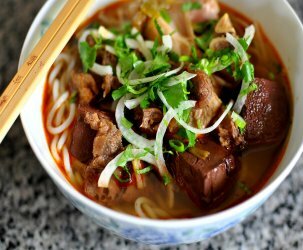 The couple fled war-torn Lebanon and opened the first American branch of Zankou in Hollywood in 1984. There are currently ten Zankou locations in and around the Southland. 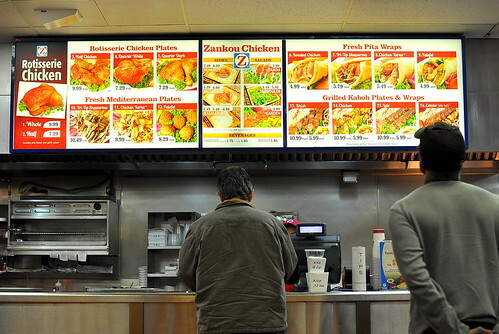 Zankou is run much like a fast food establishment. Orders are placed and paid for at the counter, and numbers are shouted out as food is ready for pick up. Business was bumping the Friday night we visited. Still, lines moved efficiently and food was prepared swiftly. Our order was ready about ten minutes after placing it. Even though we were eating in, everything was packaged in Styrofoam just in case we changed our minds. 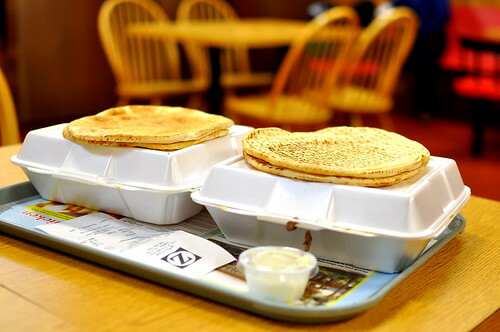 Warm and toasty pita slabs rested atop each box. 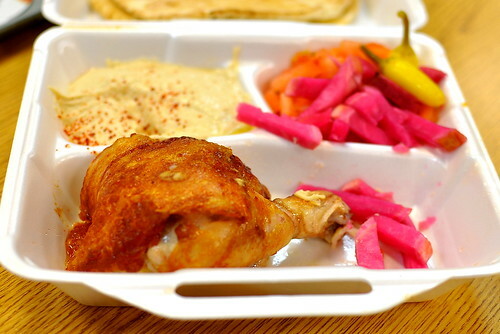 Our dark-meat quarter chicken plate ($7.29) came with a side of curiously pink pickled turnips, out-of-season tomatoes, spicy peppers, and hummus. While the leg and thigh were pleasantly moist, it was the bird’s crispy skin that really impressed. When The Astronomer wasn’t looking, I wrapped the choicest morsels in pita, slathered it with garlic sauce, and savored the entire package. Chicken skin pita wraps should be a menu mainstay. And speaking of garlic sauce, Markrid Iskenderian brought his recipe for this famously addictive condiment all the way from Beirut. It’s hard to say what’s in it exactly, but the consistency reminded me of Crisco, while the flavor was tangy and unabashedly sharp. The sauce had a way of lingering on my tongue long after the chicken was gone. 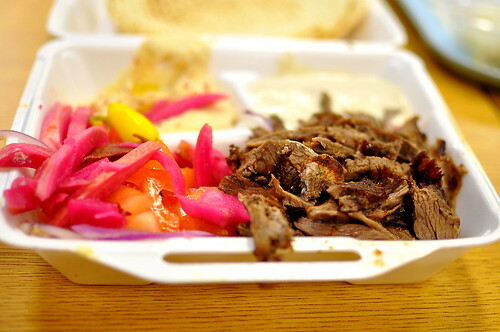 To supplement our quarter chicken, we also shared the tri-tip shawarma plate ($10.49). On the side were pickled turnips, peppers, hummus, raw red onions, tomatoes, and a creamy tahini sauce. The sesame and marinated steak paired like a dream wrapped inside the pita bread. 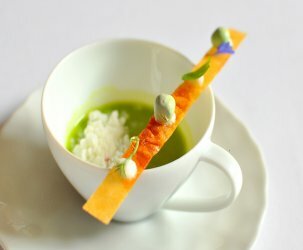 The turnips and onions were just the thing when the flavors got too heavy. 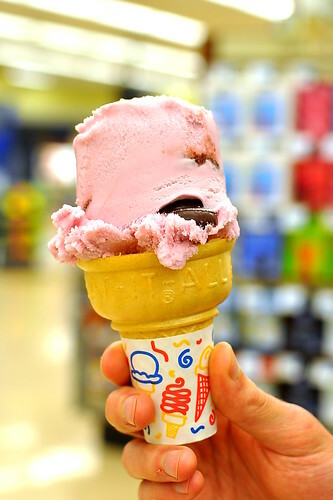 Capping off our splendid evening of supporting local establishments, The Astronomer and I walked to Rite Aid for a scoop of black cherry Thrifty ice cream. It really hit the spot. There is no greater digestif than a long walk home. My friends and I went to PCC right out of high school, so Zankou is a beloved favorite. 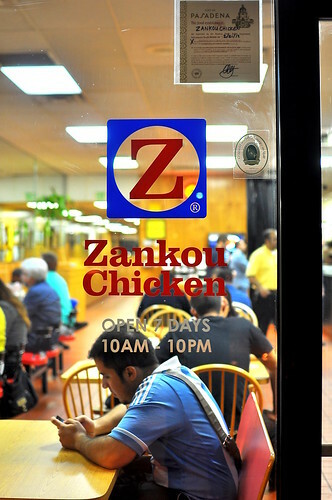 We used to say you really haven’t lived in Pasadena until you’ve been yelled at by a Zankou employee. Plus, that’s my local comic book store right next to it 😉 SO weird & fun seeing these staples from another POV! 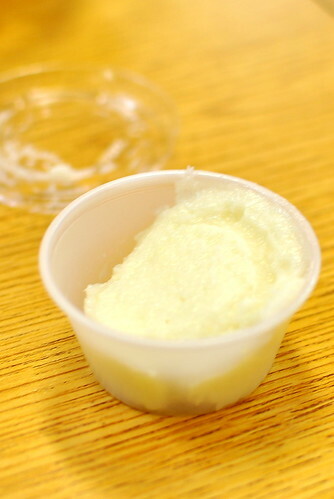 That sauce is made of garlic, mayo, and (so it’s rumored) mashed potatoes. There used to be a place on Washington Blvd in Altadena – just like Zankou but Armenian instead of Lebanese. It was amazing but closed maybe 10 years ago. The wife told me the sauce contained mashed potatoes to give it stability. I think it’s similar to skordalia. I always get the wraps. Shawarma is good, but Tarna is my fave. For some reason, they taste better than when I build my own and definitely hold up much better. I’m just that lazy and inept. Hah! Great review Cathy! So true about the garlic sauce having a crisco consistency. I took my finace, Justin, there this summer and he didn’t really like the chicken, so didn’t do the chicken skin thing that you do, so maybe he was missing out? I had the falafel and it was pretty good. Cherry ice cream at the end was a great decision. Go on with your bad self! You know, I’ve never been to a Zankou. 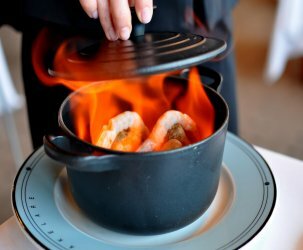 Is the chicken prepared on a rotisserie first then finished in the fryer to get extra crispy? Good question, Darin! I think the chicken just goes round and round on the rotisserie until someone orders it. I can’t believe I’ve never been to Zankou! Pasty garlic sauce and pita sounds like my dream meal. If only there was one walking distance in WeHo! How funny! I was just craving the garlic sauce from Zankou yesterday. Now, it’s official. I used to eat here regularly, but primarily for the convenience and the garlic spread. The chicken frequently came out dry and alternatively over/under seasoned. The Pavilions south on Lake Street offers a superior roast chicken. This place will always be a favorite of mine. I might be able to live off the turnips & garlic alone. So happy to see Zankou love on here! If you ever find yourself at Hollywood/Gower I recommend you check out Al Wazir which is also amazing! That said, I appreciate Zankou, but I think the rotisserie chickens at Super King in Altadena are better. AND you can buy a giant tub of the same garlic sauce (Jericho makes it). I’ll buy a chicken ($6) and garlic sauce ($3) and a couple of packages of pita ($1 each) and that will feed us lunch for a week.